Fitting in fitness is one of those things that often takes motivation and honestly, a time slot in your day. And if you have a kiddo or two, it requires time and planning. Because let’s be real, you can totally have a good plan and then one of the kids has a diaper blowout, or an off morning and you can’t make it to the gym, or whatever happens. But having a gym membership (if possible) can make it a whole lot easier with kids– once you get there of course! If you have already been a member of a few different gyms, you will no doubt already know that they aren’t all made equally. 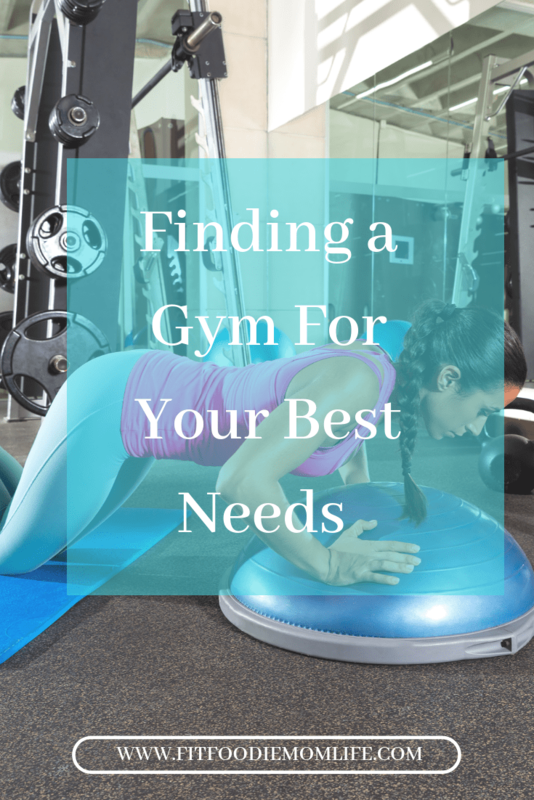 Finding the right gym can be hard as they are all so different. Plus each gym offers a variety of different classes and services. Not only that, though, but the atmosphere in gyms can vary wildly and there might be some that you just don’t feel comfortable working out in. I joined the YMCA this summer and absolutely love the service I get, the workout equipment, and the childcare. The biggest catch for me was finding a gym with a trustworthy childcare facility. I can workout in peace and know my children are taken care of and enjoying their time with good, child-friendly caretakers. Don’t worry, though, it’s still entirely possible to find the best gym for you. It just might mean trying out a few different ones before you land on your perfect one. When you are shopping around for a gym, remember these helpful pointers and what matters to you. First of all, it’s important to consider how much you can afford to spend on your gym membership every month. This should then narrow down your options as there might be some expensive gyms that you just won’t be able to afford. It’s also a good idea to check if a gym offers a payment plan, as this could make the monthly subscription a lot easier on your bank balance. Plus, if you can find a gym with childcare included in your membership, you have an added bonus! If you want to start to workout at the best gym today, you need to first take a couple of test sessions. All good gyms should offer these to give potential new members a taste of what it would be like to work out at them. If you enjoy the taster sessions, then it’s a good sign you’ve stumbled across your ideal gym! If you’re investing your time and money into a gym, you better enjoy all the benefits and what you get out of it. Of course, not all gyms are just about working out. There are some gyms that offer extra services, such as swimming pools, saunas, sports massages, and child care. Some might even offer one-on-one sessions with their own personal trainers. If you want access to these kinds of facilities and services as well as all the usual things that gyms offer, then you should make sure a gym does offer what you need before you sign up. Once you find the perfect gym that you want to join, you will be given a contract to sign. This will detail what you get with your membership and the cost that will occur each month. Before you do sign it’s necessary to read all the small print in full. There might be some hidden clauses that you weren’t previously aware of. These could be important deal breakers. Make sure you’re not locked into a year contract as you never know what a year from now can bring. The YMCA I joined offers a month-to-month contract, which makes it convenient if my plans ever change. Even though you might not think the location of the gym is super important, it’s still necessary to consider. If it is too far from your home, you might end up annoyed with the commute and stop going. The gym I attend is only six minutes from my house, which honestly leaves me with no excuses saying it’s too far of a drive. And if the weather is ever bad, I don’t have to worry about a long commute there or back since it’s less than 2 miles away. I know how important fitness is to me and so I make it a daily priority in my schedule. Every morning after breakfast I get the kids ready and we drive to the gym. I drop them off in the childcare center and I enjoy an hour and a half of warm up, working out, cool down, and a nice deep stretch. Find a gym that fits your needs, establish a good workout plan, and stick with it. When you get into a steady routine and stay on top with it, you’ll soon discover your body craving a daily workout!